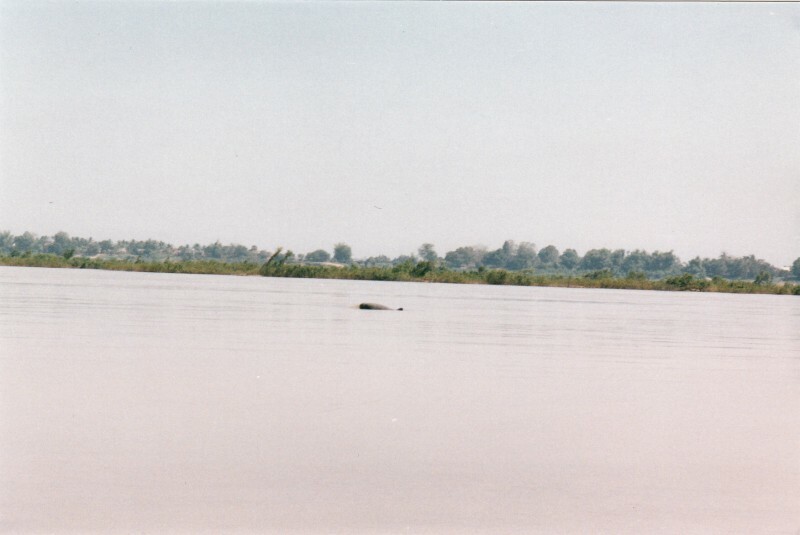 Clasico’s story: In June-July 2001 a group of dolphins was seen about 40 kms from Phnom Penh in the floodplains. This was very unusual, because dolphins are rarely seen that far south. 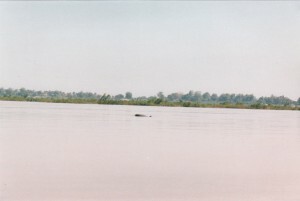 There are only anecdotal reports of dolphins around Phnom Penh in recent years and the last official sighting in the Tonle Sap was in the 1970s. 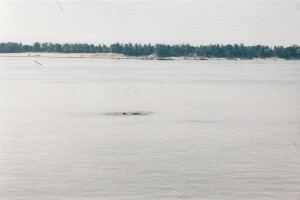 The group seen in 2001 was also unusual in that they were roaming about the flood-plain – in other words they were at large in the submerged rice paddies, in water that was only a few metres deep. These sightings were in an area called Preah An Chung. As the year progressed and the water levels dropped most of the dolphins managed to get back to the river. But two of them didn’t manage to get out and at the onset of the dry season they found themselves trapped. One was caught in a small tributary – a waterway that still had a useable connection to the river. But for some reason the dolphin failed to make use of it and remained trapped within the tributary. The second dolphin was caught in an irrigation channel – or rather a fish-pond that was connected to the river by an irrigation channel. This was the animal that would come to be known as Clasico. 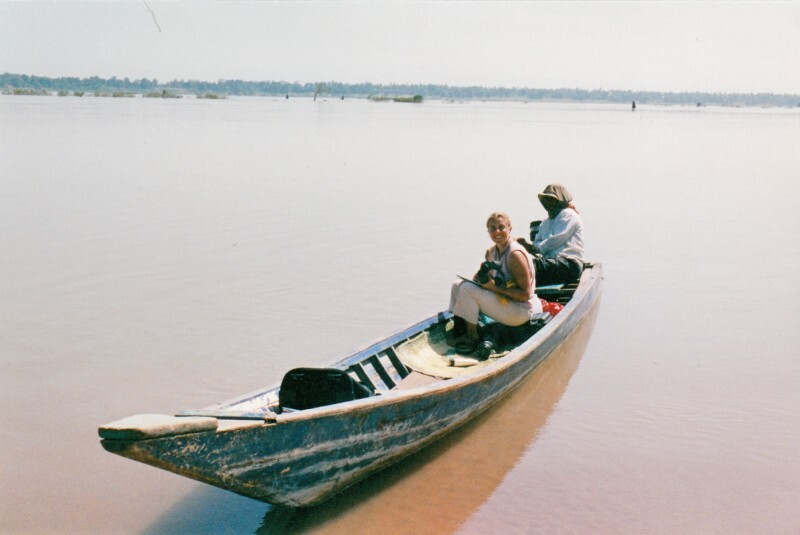 The local people alerted the Fisheries Department to the presence of these animals and through them word reached Isabel. Over the next few months, that is Sept-Nov, Isabel visited the dolphin many times – 40 or 50 times. 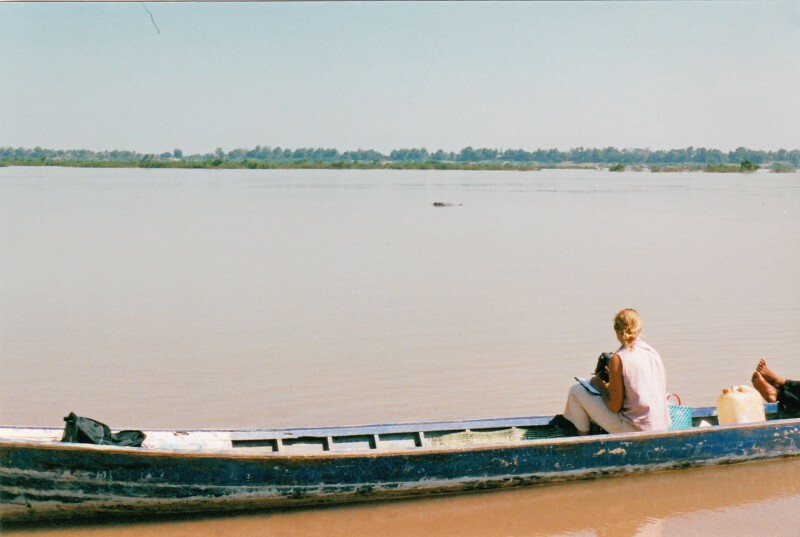 She would spend weeks at a stretch in Phnom Penh and every day she would drive out, on a hired moped, to see the dolphins. She’d visit both of them but she’d spend more time with Clasico because he was caught in a smaller pool and it was evident from the start that at a certain point he would have to be caught and released. The other dolphin had a larger area to inhabit and Isabel assumed that he’d be able to get out under his own steam some day. But with Clasico she had to take many precautionary measures from the start – she took soundings of his pool and built a fence to keep boats and children out of the deeper areas. Because the pool still had a connection with the river, the fish escaped and the dolphin’s food supply dwindled. So she started bringing Clasico fish to feed on. The fish were barely alive when she got them there and Clasico would eat the first couple but not the others – this despite the fact that he was losing a lot of weight and was becoming quite emaciated. Almost nothing is known of the parental and mating behaviour of orcaella. There are only speculations based on what is known of other species, particularly Tursiops which have extensively studied in Shark Bay in Australia. By noon the sun was burning hot and Isabel decided to move on to the pavilion on the water at Kampi, just below the observation station. Here, in the shade, it is very tranquil, with cows grazing on the banks behind us and dolphins surfacing repeatedly in front of us, within a dozen yards. At Chroy Banteay we briefly glimpsed a dolphin throwing up water. Isabel thinks this is done in two ways – one is by butting the water; the other is by actually spitting. Whenever Isabel has observed this, the dolphin spits repeatedly in a kind of semi-circle. Her ‘very preliminary’ hypothesis is that its creating a curtain of bubbles so that the fish will turn back and head directly towards it (the dolphin). Apparently fish are often reluctant to swim through bubbles. This makes more sense to me that the notion that they spit in order to herd (towards whom?). The dolphins keep surfacing all around us, as we drift in the water here at Chroy Banteay, but always unpredictably. At 11 am it is very hot, the sun relentless. Isabel is without a hat or any protective gear. She is standing, camera at the ready. That’s all she’s done all morning, and that’s all she’ll do all day. There are long periods of quiet followed by sudden rockings of the boat as she spins around to take a picture, after a dolphin announces its presence with a snort. Often these bursts of activity are followed by mild expletives, occasioned by the missing of a shot. For almost an hour now our boat has been beached pretty close to the shore, and we’ve repeatedly spotted the mother-and-child pair of dolphins. Isabel thinks that the young one might be a juvenile because it seems to go off on its own a bit. But the pair have stayed within fifty metres of me, surfacing in tandem repeatedly. They are occasionally joined by a couple of others – but the mother and child seem to stay together. In the distance, booming faintly across the water is the throbbing of a bass guitar – somebody’s amplified karaoke. Isabel says that this is one the best morning’s viewings she’s ever had and she thinks she may even have identified a couple of new individuals – she hadn’t seen the mother before. Isabel also carries a Global Positioning System device – a small hand-held unit, which she uses to establish the co-ordinates of each sighting. April-May is the height of the dry season and in those months the rivers fall. The topography of the river is very scattered here – there are many little islands and outcrops of rock, and also large clumps of bushes. 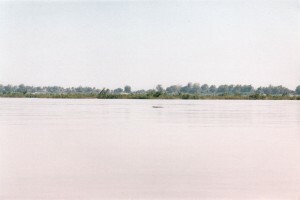 Isabel says that dolphins are often seen in the vicinity of the bushes, possibly because fish breed more plentifully around the bushes and islands. A short way up from this stretch of river are some rapids. Between here and Stung Treng and the Laos border there are many such rapids, some quite steep. 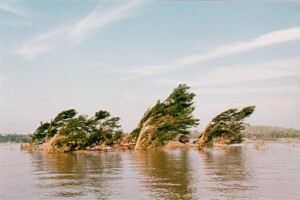 At some times of the year when the river is high, there are navigable channels that skirt the rapids, but at other times of the year the rapids are impassable. Apparently the Chinese have hatched a plan to make the Mekong navigable all year round, so that big container ships will be able to travel much farther up. To do this they will simply blow up the rapids and make the river deeper in those stretches. This had caused great concern for Isabel and others in the conservation community; they think that it will greatly endanger the dolphins and other species. 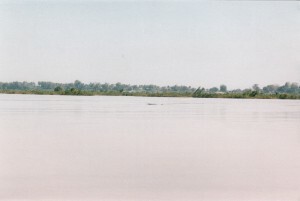 The rapids are close enough to be visible from the pools at Kampi and Chroy Banteay. It is hard to see how explosions so close by could have anything other than a catastrophic effect. The dolphin pools have very distinctive shapes and the dolphins seem to dislike certain kinds of underwater topography. 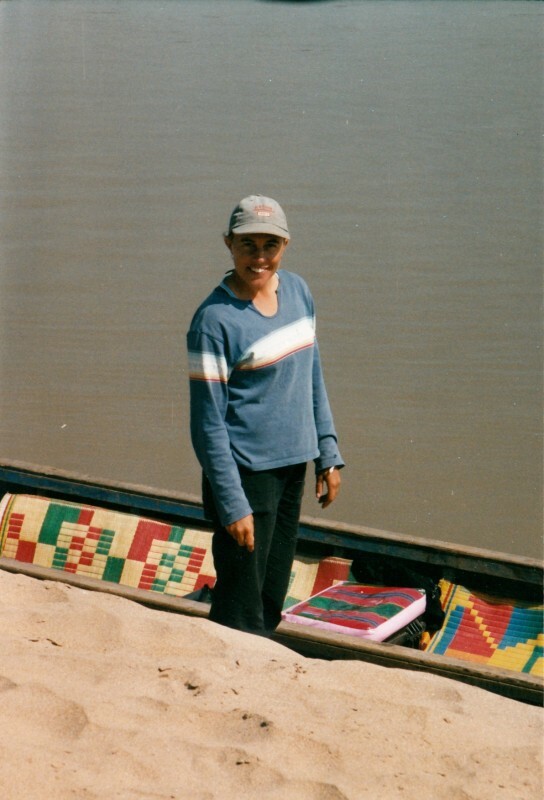 Isabel and her associates take regular soundings of the river bottom, with a hand-held sounding device. 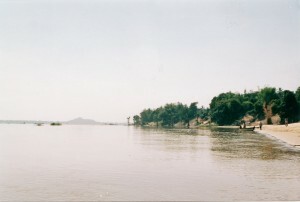 A detailed topographical survey of the Mekong has also been conducted recently and she uses that in building a comprehensive picture of the riverbed and the kind of underwater terrain favoured by the dolphin. Generally speaking she finds that the dolphins don’t like very deep passages. There are areas that plunge to seventy metres, but the dolphins stay away from those stretches. They prefer pool shaped areas that are from 10 metres to 30 metres deep. These areas are also generally pool-like in shape. Less than 10 metres they don’t seem to like although local people have told her that they’ve seen animals occasionally going really close to shore. Since coming over to this pool we’ve had good luck and have seen several animals surfacing quite close up. But Isabel has not been able to get any really good shots. This is very frustrating for her. The animals generally surface once, twice, and then they disappear. If you haven’t caught them by the second shot you’ve missed your chance. Isabel counts herself lucky to get one good shot a day. Yesterday she got a good dorsal-fin shot of Rags – that made it a very good day. The day before she got a good shot of Clasico. 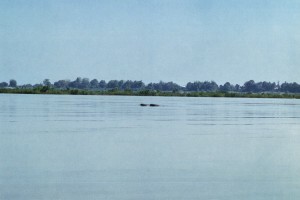 While speaking of Pilleri’s experiments with Indus dolphins (the animals he took to Switzerland) I mentioned one of his findings* – which was that he’d found the dolphins to be very sensitive to atmospheric pressure, to the point where they would respond to storms even before they had actually struck the area around the laboratory. Isabel says that this is widely reported also of orcaella. The local people says that the dolphins can be observed to behave differently before storms, jumping out of the water etc. This has been reported also of coastal orcaella, so it seems plausible that there is some kind of behavioural response to storms and atmospheric changes. *see: Pilleri, G., 1970 b. The Capture and Transport to Switzerland of two live Platanista gangetica from the Indus River. Investigations on Cetacea,II. Altogether Isabel recognizes some seven or eight individual dolphins and she has even named some of them. Most of them have Cambodian names. 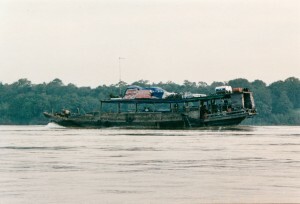 ‘Clasico’ was caught near Phnom Penh; ‘Moi’ (‘one’ in Khmer) was the first one we saw; ‘Tri-fin’ is the one with the triangular fin; ‘Rags’ is another one in the Kampi pool, recognizable because of its ragged dorsal fin. ‘Tamasu’ is named after an area farther north. Most of them she has seen frequently and they are relatively distinctive – this is why she is able to identify them by sight. Clasico has an interesting story which I’ll come to later. One of Isabel’s discoveries about Orcaella is related to its spitting behaviour. This behaviour was reported long ago, even by Anderson (of Orcaella fluminalis fame), but Isabel thinks that she knows why Orcaella spits. It is in order to herd its prey – that is, to direct shoals of fish in one direction or another. Another discovery is that orcaella uses its tail to hunt – that is, slaps fish with its tail, stunning them. They float to the surface. This was initially suggested to her by local fishermen, who said that they had seen dolphins doing this. She became aware of it because she repeatedly encountered a certain ‘thwack’ sound and then saw fish floating to the surface. Then a dolphin would come along and eat the fish. At first she thought that the sound might be related to echolocation, and this might also, somehow, account for the stunned fish. But then she decided that it resulted from an actual blow, from the fish’s tail. She thinks that this might be a part of orcaella’s genetic inheritance – since Orcinus orca [the killer whale, to which Orcaella brevirostris is related] is also known to kill fish with its tail. Out on the river: at 7 this morning we set off in a Fisheries department boat, to spend the day on the river. We made our way back to the spot we were at yesterday, near the pool at a place called Kampi (pronounced Gumpy) where the observation area is. The boat is small, without a hull or any kind of shelter. 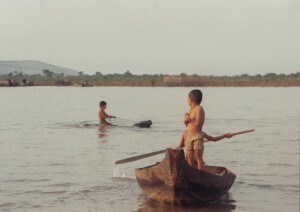 The boatman is a middle-aged Cambodian, an employee of the Fisheries Department. We chugged along, quite close too the shore, which was line with boats of many different kinds – big junk like boats and small fishing boats. They were like a floating village, and filled with people, some of them had little floating platforms on which they were growing vegetables – little gardens. It was cool at that time of morning, almost cold; it warmed up as we went along. We’re at Kampi now – the river here is about 2 ½ miles wide and we are at midstream. Isabel is excited because we’ve just seen a calf (or possibly a juvenile) surfacing. She’s also spotted another animal she recognizes, because of its triangular dorsal fin. Triangular dorsal fins are apparently a great help in identifying the animals. In the 45 minutes or so that we’ve been here, we’ve seen some six to eight different animals surfacing. We’ve also spotted the calf, many times, and Isabel has the feeling that it’s very young and is accompanying its mother. This pair seems to be associated in some way with the dolphin with the triangular fin. At 4 in the afternoon we went out to the observation platform where Isabel spends most of her time when she is doing ‘land-based’ research. It is about fifteen km from here and we went in a hired car. It’s on a bluff where some four or five benches have been arranged – this is where the tourists go to observe the dolphins. The ‘pool’ where the dolphins live is some hundred feet below. Typically Isabel spends her day sitting on the bench, in the sun, watching the water with her binoculars and taking photographs. She notes down surfacing times and takes pictures of dorsal fins, so as to make a record of individual animals. It’s very slow, patient work. Isabel has identified some half-dozen ‘pools’ where the dolphins characteristically gather. These pools were all identified with the help of local people who told them where they were. In the beginning Isabel wondered if the people might have missed some of the pools, so she watched closely when traveling along the river. But despite her best efforts she never sighted any dolphins at other spots: apparently the locals were right. The dolphins did indeed live in those pools and nowhere else. 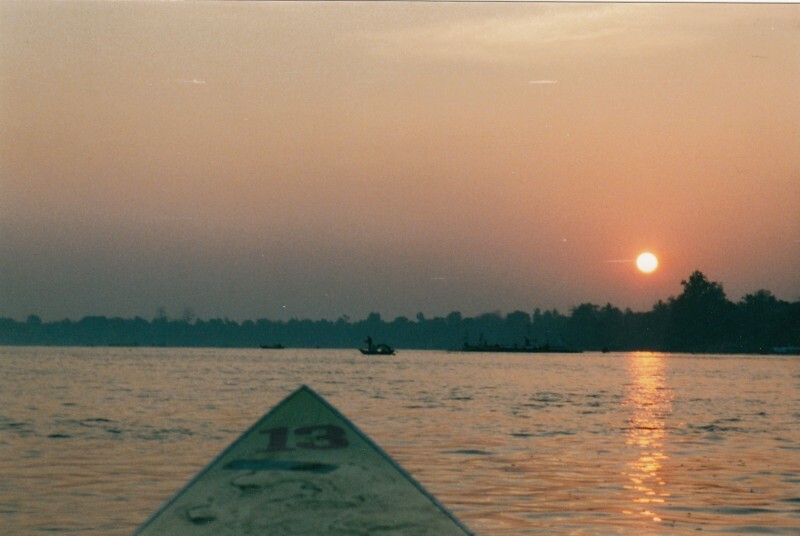 so we went down to the water and took a boat, rowed by a brightly smiling Cambodian boy. As we rowed past the pool, several dolphins surfaced around us. Their surfacing is a much more noteworthy affair than that of Platanista [gangetica – the Gangetic dolphin]. They make a loud, explosive blowing sound and expose a good two feet of their backs. But they are just as erratic and unpredictable – it’s impossible to know where they are going to show themselves next. 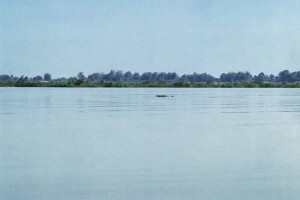 Isabel said that this is a characteristic of the riverine species of Orcaella [brevirostris – the Irrawaddy dolphin]. The marine variety of Orcaella is more predictable in its pattern of surfacing – a little more like other marine dolphins. The river was beautiful, with a bright, orange sunset reddening the water and the sky. The town [pronounced kra-chay] looks handsome from the river. There is a line of freshly-painted villas and the landing consists of a steep flight of stairs. But it is hardly a ‘town’ – just a couple of streets of pucka houses, sleepy-looking, quiet, charming in a way. 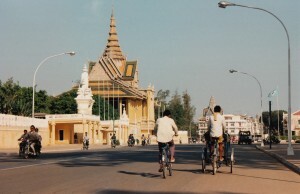 At any rate, a great relief after the chaos of Phnom Penh. 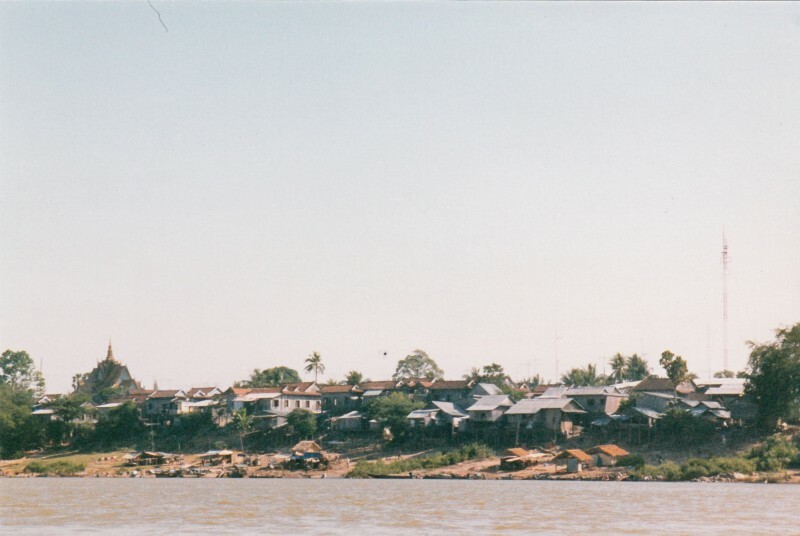 Isabel [Beasley] lives on the second floor of a small Khmer house that overlooks the river. 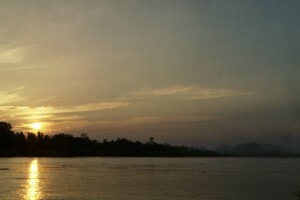 The view from her balcony is terrific – a broad swathe of the Mekong, with beaches of white sand on the curves. The house is built of polished wood and even though it isn’t built on stilts it somehow has the feel of a house on stilts. The landlord lives downstairs – a friendly Khmer family – and Isabel has the upper floor to herself. She’s kept it very bare and clutter-free which suits it well. The breeze blows right through and it’s very airy and well lit. Also comfortable – there’s a fridge and a shower and a good bathroom with a chowbaccha [open tank]. It doesn’t have a kitchen however, and Isabel evidently has all her meals out. There are some nice little warung-type restaurants lining the riverbank. We went to one of those for lunch and the food was delicious. Right opposite the river-landing is a freshly-painted quite opulent building, with a sign that proclaims it to be a kind of dolphin headquarters. I was surprised to come upon an institution dedicated to dolphin research but it turns out that dolphins are a big deal in Kratie. There were many backpacking tourists on the boat up from Phnom Penh and Isabel tells me that they all come to Kratie for the dolphins. 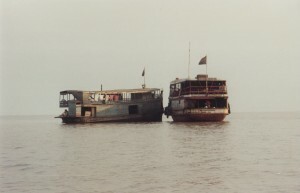 The boat (Express motorboat) from Phnom Penh was perhaps the most horrible vessel I’ve ever traveled in. I had to squeeze myself into a tiny seat, in the middle of a row of three. There was a video system blaring music and playing Cambodian MTV-style song sequences. It was a nightmare.